No matter the cause or scope of a fire, an intervention is required. From the moment of your call, we put into place all which is necessary in order to offer you the best solution, and thus, reducing the damages to a minimum. 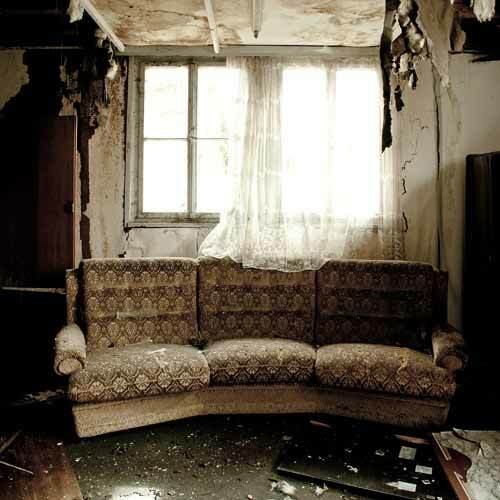 The quality of our intervention (fire damage restoration) following a disaster will allow you to return as quickly as possible to an environment which is safe and comfortable, free of mold and bacteria which can cause health problems. The smallest of fires can cause significant damage to your home. Fire damage restoration is a delicate task that should be conducted by experts like us! Even if the fire in itself remains the main element of destruction, smoke and soot can also end up causing enormous damage, as well as the water used to extinguish the fire. Once the fire is extinguished, the damages can expand due to the chloride contained in smoke. The proper removal of smoke residue and soot can prolong the life of your electrical appliances. Whether you have extinguished the fire or call upon emergency services, water or other method used to extinguish the fire can seriously damage your property. Royal cleaners take care of everything! 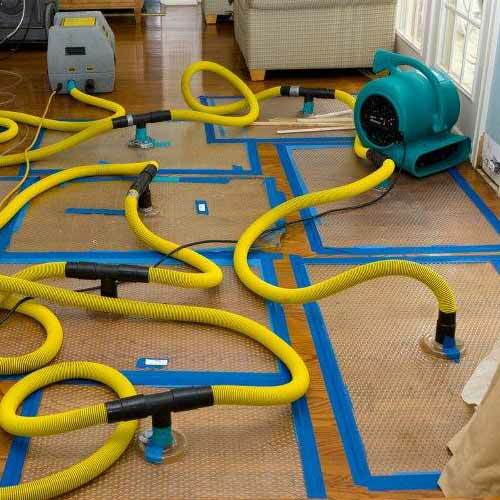 Drying and dehumidifying the affected areas. Complete restoration of the property. Our team and equipment will be on hand in less than an hour! Royal Cleaning is an expert in disaster restoration (flood or fire damage), our IICRC certified team will make the difference. Our immediate task is to quickly clean it to reduce the heightened risks and assess the damage. Disaster restoration is a delicate task entrusted by your expert to our company. Below are some examples of cleaning after disaster and decontamination procedures. Whatever the cause or scope of the water damage, be it water leakage or flood, quick drying of your home and good sis a must. From the moment you contact us, we put everything into place in order to offer you optimum solutions in order to minimize the damage. The quality of our intervention following the disaster will allow you to return in the quickest time possible to a safe and comfortable environment, free of mold and bacteria that can cause health problems. Drying without demolition equals a large saving of time and money. Today’s technology, coupled with Royal cleaners know how, allows the areas that have been damaged to be completely dried without the need of demolition. 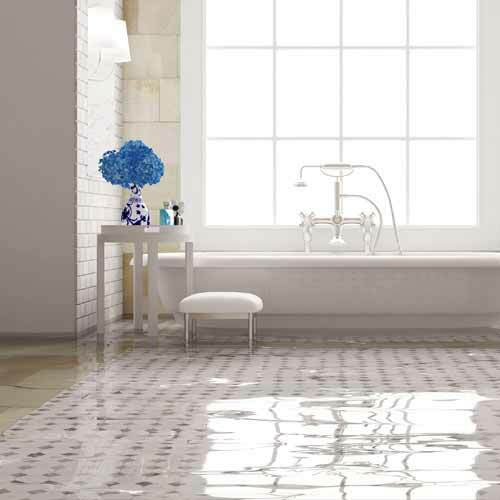 Our strict protocol will eliminate all traces of water and humidity, surface and deep down. Making sure that no mold appears, never! And that the air is free of any persistent humidity. Removal and temporary storage of all goods. This service is highly secure. Royal cleaners takes care of everything! You pay nothing. Direct billing to your insurance company. 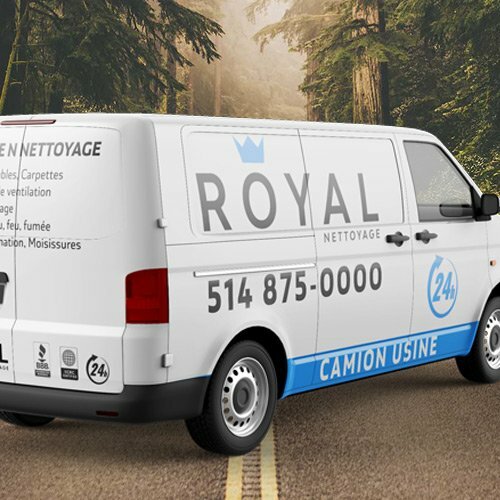 Royal Nettoyage has all the necessary tools to decontaminate your home. Our team of experts will go on-site to prepare a free, detailed service proposal that respects your priorities, your activities and the required security standards of the occupants of your home. Decontamination, especially due to major mold problems, requires specialized expertise. Our team specializes in cleaning, drying and decontamination without damage to the property. To complete our services, we’re also upholstery cleaner, allowing you to recover rapidly by using your furniture for better living. Mold is a fungus what is grows on food or on humid construction material. It often appears in the form of a stain, which can be of different colors. In some cases, mold may not be visible but can manifest itself with a mold smell. Its growth can lead to poor air quality indoors. Laundry, cooking, other factors can humidify the air, condensation and the infiltration of water can lead to a level of humidity that will produce mold. Poor ventilation can also lead to increased levels of levels of humidity and the formation of condesation, which will lead to mold forming. For it to reproduce, mold gives off spores that linger in the air that are so tiny they can be inhaled. The presence of mold spores are constant. When mold grows on the interior, the number of spores fragments to such an extent that the level of mold is higher in the interior than the exterior. Risk for health associated to presence of mold in your home. Asbestos has attracted the attention of some industry in the late nineteenth century to its resistance to heat, fire, voltage, electrical and chemical attacks and to their absorbency. In its friable form, it has been used in many lagging and sprayed coatings, as well as sheets, markers, adhesives, sealants, cardboard plates, or woven or braided. It is also found (not friable form) incorporated into cement products (asbestos cement) or in various binders (adhesives, paint, seals, gypsum mortars, concrete, friction materials and even road asphalt or sealing …). It has also been used for the brake pads or trim boiler or electric ovens, or in various electrical systems (ex: hotplates) for its high temperature electrical insulation capabilities. It was heavily used in buildings for its flame resistance, insulation, flexibility, tensile strength and sometimes for its resistance to chemicals. The technical asbestos removal and equipment safety standards are subject to a rigorous practice. 1- Site preparation and isolation of the area to be decontaminated. 2- Construction of hermetic areas to prevent the spread of asbestos fibers and installation of decontamination units. 3- Continuous monitoring of the safe level of airborne fibers through laboratory analyzes. 4- Partial or complete reconstruction and cleanup. Our company encompasses the following conditions. Provide the consumer precise information and run our company with honesty and integrity. All our technicians have received formal training and have successfully passed all the needing testing requirements. Ensure a continued training program, thus, keeping our technicians up to date on all changes in the industry. Maintain civil responsibility insurance in order to protect you in case of accident.